Chia seeds have been popular in health food circles for years, for good reason -- they're relatively affordable, highly nutritious and have a mild flavor that works in many dishes. And while chia seeds are moderately high in calories, thanks to their healthy omega-3 fatty acids, their fiber content makes them a welcome addition to weight-loss diets. Experiment in the kitchen to add chia to weight loss-friendly breakfasts and snacks to help you shed pounds. When you're adding chia to your diet, make sure you only use seeds that have already been hydrated in fluid -- eating the dry seeds on their own poses a choking hazard. No single food, even a nutrient-dense one like chia, can make or break your weight loss on its own. To lose weight the healthy way, you'll need to follow a balanced diet that provides fewer calories than you burn each day -- that way, your body taps into your fat stores as a source of energy. The number of calories you'll need daily depends on several factors, including your height, weight, body composition, activity level, age and gender, and it can take some trial and error to figure out how many calories you burn each day. But cutting your calorie intake by 500 calories a day will help you lose an average of one pound a week, which is a safe rate for weight loss. 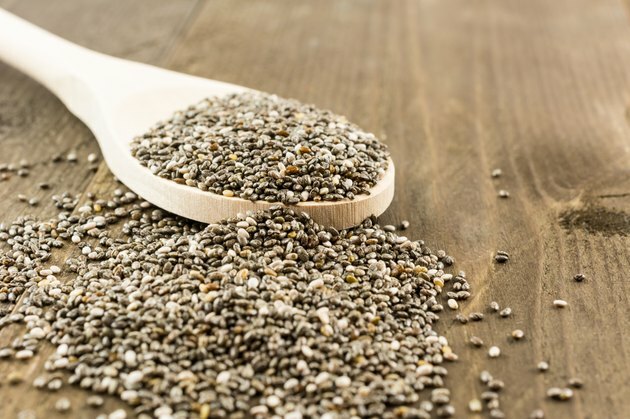 A 1-ounce serving of chia seeds provides 138 calories. That's roughly 9 percent of the daily calorie limit for a 1,500-calorie diet, or 7 percent of a 2,000-calorie diet. That's a significant chunk of your daily calorie intake, but you'll also get a lot of nutritional value for your calorie investment, so chia is a worthwhile addition to your weight loss diet. Chia seeds come packed with dietary fiber -- roughly 10 grams per ounce of seeds. That contributes a significant amount toward your daily fiber intake goals, which can range from 21 to 38 grams daily, depending on your gender and age. Simply eating more fiber is a great way to lose weight even if you don't make other dietary changes, reports Harvard Medical School, and chia significantly boosts your fiber intake. There's conflicting evidence on whether or not chia can directly cause weight loss. A study published in Nutrición Hospitalaria in 2014 looked at the effect of eating chia flour -- ground chia -- each day for 12 weeks. The authors found that the study subjects who ate chia each day experienced slightly more weight loss than those who didn't, and also had a small reduction in their waist size, which suggests that chia helped burn belly fat. However, an earlier study, published in Nutrition Research in 2009, found that chia didn't offer any weight loss benefits. So while chia has nutrients that promote weight loss, you shouldn't count on it as a magic bullet to shed fat. Starting your day with a meal that contains chia can help you shed pounds. Not only is eating breakfast linked to better weight control, but starting your day with a fiber-rich food like chia could help you feel full longer and avoid snacking throughout the morning. Stir a spoonful of chia seeds into your oatmeal as it cooks, adding water as needed to get the consistency you like. Or add a spoonful of whole or ground chia seeds to your favorite smoothie. Not only does the chia make your smoothie more filling, but it absorbs water to make your beverage thicker and richer-tasting, so you'll feel more satisfied. Sprinkle ground chia into your eggs when you make scrambled eggs or omelets, or make three-ingredient "chia pancakes" using egg whites, banana puree and whole or ground chia seeds. Include chia in other meals to help your weight-loss efforts. Make a healthy and filling chia "pudding" by mixing whole chia seeds in unsweetened almond milk until the mixture thickens and forms a gel -- about 3 to 5 minutes. Add variety by mixing in flavorings -- try banana puree and cinnamon, applesauce and apple pie spice or even chopped strawberries and cacao for decadent-tasting snacks. Mix chia seeds with pureed berries to make sugar-free berry "jam" that you can use as a topping for whole-grain crackers or toast, or mix a spoonful of whole chia seeds into ice-cold sparkling lemon water for a healthy "spritzer."